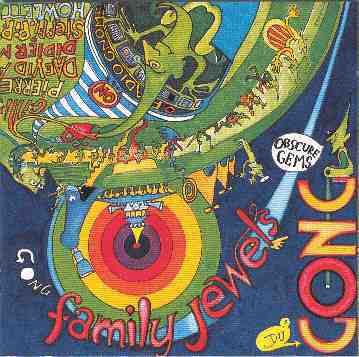 gong's "space jazz rock" should need no introduction. daevid allen, gilli smyth, pierre moerlen, didier malherbe and pip pyle have been around for quite a while and they've already published a huge catalogue. gas records originally started out as a fan club (gong appreciation society) but was taken over 1986 to become a mail order network. gas publishes all sorts of merchandise, including records. "family jewels" is such a thing. it's two cds, but more then half of the tracks are taken from previous releases. so it's a sort of "best of" compilation, but with a lot of unreleased tracks. one of the unreleased tracks is 'little house i used to live in' (frank zappa), performed by pierre moerlen and l'orchestre regionale de jazz d'alsace. it's taken from a concert registration in strasbourg in 1997. on the cd, it's right behind david allen playing miles davis' 'so what'. Two Gong Concerts in London this June and the release of the special Gong UNcon Limited Edition Double DVD. For the latest transmission from the luminous green planet Gong dada 'hymn-self', Daevid Allen, is joined by co-founder Gilli Smyth, the motherbeat bass of Mike Howlett, master drummer Chris Taylor, incomparable jazz saxophonist Theo Travis - and for the first time in the UK since 1975 - Steve Hillage & Miquette Giraudy! New energies are in the air – new recording plans are being discussed – a new DVD from the legendary 2006 Amsterdam Uncon event is being released – and these two June 2008 London shows are an important step along a new pathway. Both these special events also have a special limited 'Early Bird' ticket offer available to you. To get tickets in advance of the general on-sale date of 25th April and claim a 5% discount you need to call 0871 663 2500 (UK) or +44 871 663 2500 (from abroad) and quote 'Fan offer'. This offer is for phone and in person sales only. The offer comprises a £1.25 booking fee as opposed to £2.45. Non-UK purchasers will be able to pickup their tickets on the night of the show. UK purchasers will also have the additional benefit of a £2.50 postal processing cost (First Class Post Recorded Delivery) as opposed to the normal £4.90 processing fee. Gong UNcon Limited Edition Double DVD - Pre Sale Orders Being Taken Now! Disc 1 - A professional four camera shoot of the magical Uncon Gong set with Daevid Allen, Steve Hillage, Tim Blake, Gilli Smyth, Mike Howlett, Miquette Giraudy and Didier Malherbe, Theo Travis and Chris Taylor. Disc 2 - A documentary style film that delivers a real vibe of and insight into the magic of the Unconvention with many illuminating and humourous interviews and footage of Mother Gong, Kangaroo Moon, Acid Mothers Gong, University Of Errors, Here & Now and more, as well as Steve Hillage Band - for the first time since 1979!